The biggest mistake you can make when you're starting a small business online is to aim too broadly. Internet business success comes from identifying a tightly focused niche market on which you can concentrate all your efforts and resources. So how do you know if you've found one? Here's a quick way to evaluate a potential business idea or niche market and see if it has legs: Look at what people are paying to advertise on its keywords. Typically, where there are high pay-per-click bids, competition in the natural search engine results is also high. Maybe too high. If you can't afford to compete for a top spot in the sponsored listings for the most desirable keywords, should you even bother with this market? Well don't give up just yet. Many PPC advertisers make exactly the same mistake aspiring online entrepreneurs do: They aim too broadly. They pay ridiculous amounts of money to get listed in the top spots for keywords that are far too unfocused and simply won't convert. Knowing that, you can take advantage of pay-per-click data to determine if you've found a viable market or not--before you get mired in an online business with no potential. 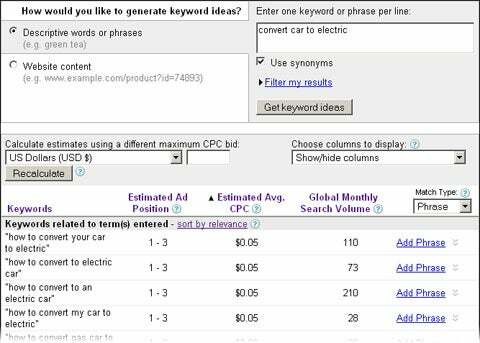 Use the free Google AdWords Keyword Tool to see how many searches are being done monthly per keyword, and how much advertisers are spending per keyword for a top position in the sponsored listings. To do this, enter a few terms associated with the niche you've identified and tick the Use synonyms box. It's a saturated market. Stay away, no matter how attractive the global search volume looks for each keyword. It's going to cost you too much, and you don't have the experience to compete. It's too broad to be a niche in the first place. In this case, you've got an opportunity to narrow your idea down to a laser-targeted niche. Try looking through the list for "clusters" of keywords that all point to the same problem. Then you can generate further keywords from those and see how the numbers look. This refining process is a big part of finding a golden niche. there are lots of reasonably priced keywords ($0.25 and under) in the top three positions. there are reasonably priced keywords in lower positions but still on the front page. the combined monthly searches for the affordable keywords add up to a worthwhile number--a few thousand, at least. These are indications that you've found a genuine niche market, and it's worth looking at the competition to see if you should continue. For competition research, again, the Google keyword tool is your best pal. Go through the keyword list and Google each one. Look at who's paying to appear in the top ad positions above the natural search results. As you go through the list of keywords, you will likely see a trend--the same sites will start showing up over and over. Those sites give you a pretty solid idea of who your biggest competition would be: These are the ones that are serious enough about their business to spend money to appear in those top results. When you visit the sites of those top advertisers, you can find out what your potential competitors are selling and how well they're doing it. It's a good idea to set up a spreadsheet to keep track of all this information. You don't have to record every detail for every site, but jot a few notes down for each one. How could my business fit in with the competition? Is there room for me in this market? Are there any gaps in this market that I can fill? Are people buying in this market, or do they expect everything for free? What could I do better than the sites I've seen? This is a quick and dirty method of validating your niche market, but it's based on hard dollars that real businesses are spending to compete. If seeing those numbers won't stop you from making the biggest mistake in online business, what will?